Badminton biggies - Saina Nehwal and Parupalli Kashyap got hitched and here are all the pics & deets! Saina Nehwal tied the knot to her long-time boyfriend Parupalli Kashyap in a very intimate ceremony and then threw a grand reception last night. Here’s saying that it sure was an affair to remember. 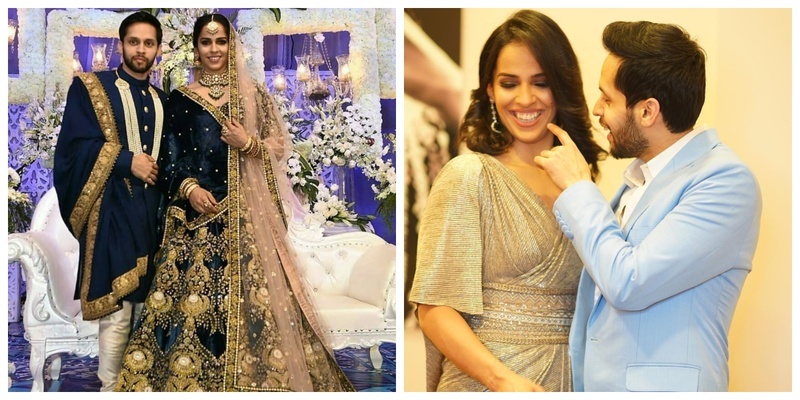 Saina Nehwal stunned in a rich indigo velvet Sabyasachi lehenga, intricately embroidered with zardosi, appliqué, pearls and crystals, for the wedding reception. She completed the look with a wedding jewellry-set crafted with Burmese rubies, uncut diamonds and emeralds from the Sabyasachi Heritage Jewelry collection. Parupalli on the other-hand complimented his bride in a quilted indigo sherwani in hand-dyed Murshidabad silk, which was accessorized with hand-crafted Bengal tiger buttons. He layered the sherwani with a beautiful tussar georgette shawl with antique ‘tilla’ borders in burnt gold. He completed the look with an uncut diamond and pearl necklace from the Sabyasachi Heritage Jewelry collection too! Yes, their cake matched their outfits and the decor! Seems like the couple’s hearts were bleeding blue and so was their wedding decor. I, for one am loving the use of blue and the white hanging frames, with chandeliers in them. It gave the whole venue a very royal vibe! Seems like the couple had a sangeet/cocktail party and by looking at the pictures, I am thinking they had a blast! The couple tied the knot in a very closed knit ceremony and definitely took the internet by a storm when they shared their official wedding pictures. Saina looked stunning in a pastel hued lehenga with an ombre blue choli and a very elegant lehenga skirt with blue and pink floral embroidery paired with a pink and blue sheer net dupatta! Parupalli on the other hand looked his dapper self in a pink silk uneven kurta paired with a similar nehru jacket, white pajamas and statement shoes!